Italian glassware combines blue bowls with green stems for a flower-like appearance Glassware handcrafted of mouth-blown and hand-painted glass. Gold-lustre embellishment. Mouth-blown water glass. Hand painted, with gold lustre embellishment. Glass stemless flutes. Set of four. Crafted from crystal, the Villeroy & Boch Boston collections bring charm to your table. 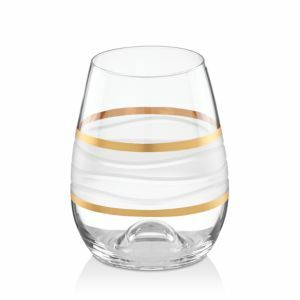 Golden stripes give the Hampton Street glasses old Hollywood glam, perfect for setting up your bar. These retro glasses make the perfect registry gift, too! Old-fashioned glasses with key design. Crafted of glass. Set of four. Painted stemless goblets. Crafted of glass. Set of four. Highball glasses with weave design. Crafted of glass. Set of four. Handcrafted crystal glass. Handcrafted crystal wine glass. An elegant update to one of our signature crystal collections, all mouth blown and hand cut 24% leaded crystal. The intricate geometric elements of Mughal architecture found in palaces throughout India were the inspiration behind Michael Aram's elegant collection. The rustic texture of wind-swept palm fronds was the muse behind Michael Aram's sculptural Palm collection. Modern footed glasses perfect for everyday use. Handcrafted of glass using centuries-old techniques. Dishwasher safe. Made in the USA. 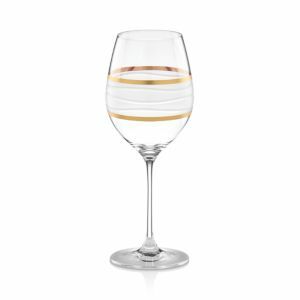 Clear glass stemware boasts a clean and simple design versatile enough for casual and formal affairs alike. Handcrafted. Dishwasher safe. Made in the USA. 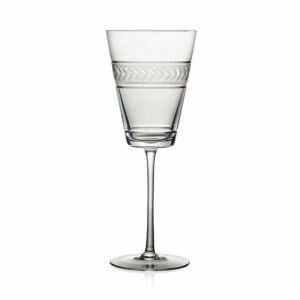 Turn formal affairs into true celebrations with Duchesse stemware from Vera Wang. The renowned bridal designer marries tapered bowls with a blazing starburst cut and beautifully flared stems. Radiant crystal is topped off with a smooth band of polished platinum Renowned bridal designer Vera Wang and Wedgwood team up to create the elegant Duchesse Gold Stemware collection. These fine crystal glasses feature glimmering starburst cut designs with gold detailing for a style that shines In a collaboration worthy of Wallis and Edward, renowned bridal designer Vera Wang and Wedgwood have created Duchesse stemware. Featuring tapering round bowls and a blazing starburst cut that contrasts delicately with the textures of the matching dinnerware, Duchesse sits on a flared pedestal. Dressed to impress. 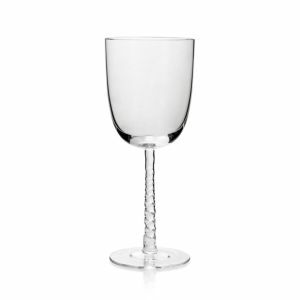 Tiny flat cuts create a shimmering effect in the sumptuous crystal of Vera Wang's Sequin stemware collection. Minimalist stems balance the stunning design with understated elegance. Capture the glamour of Miami Beach with stylish crystal drinkware by kate spade new york. Chic as its namesake, this scintillating collection features narrow cuts that catch the light with ease. Big on elegance. 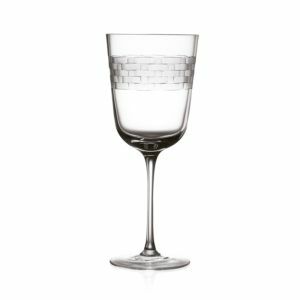 The Gardner Street Platinum Signature collection features the same etched vines and fluid lines as regular Gardner Street crystal stemware, but on an even grander scale. A perfect complement to kate spade new york dinnerware. Party of four. With etched polka dots in luminous glass, Larabee Dot glassware sets epitomize the modern elegance and irresistible whimsy of kate spade new york. 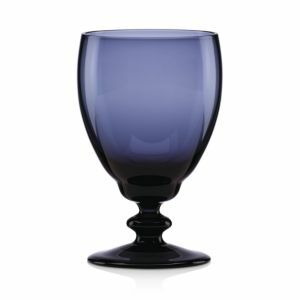 Three sharp lines juxtapose the fluid elegance of Percival Place crystal stemware, rendering the crystal extra brilliant in this sophisticated kate spade new york collection.